NAPA Sprint Cars and Super Late Models co-headline this years Rips Napa Night at the races along with Dwarf Cars, Pure Stocks and the Robert Horne Ford Bomber championship. At the end of the eventful evening the mechanics get their crack at track dominance for the annual mechanics race. Racing action begins at 6:30pm. Cost of admission for this show is $15 for adults, $12 seniors, kids 11 and under are FREE!!!!!! Spectator gates open at 5:00pm and pit gates open at 4:00pm. Arizona Speedway is located within ET Motopark at 47800 N Ironwood Dr, San Tan Valley, AZ 85140. 4 miles south of US60 on Ironwood Dr. just 5 minutes from Mesa, AZ. . 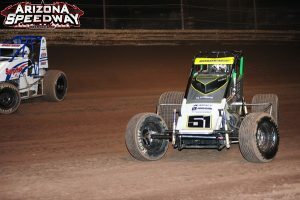 Follow us at www.Facebook.com/ArizonaSpeedway log onto www.ArizonaSpeedway.net or call 480-926-6688.